Heavy rain at Takashinga Sports Club during Sunday afternoon brought the Pro50 Championship match between Rising Stars and Manicaland Mountaineers to a premature close. A result could not be calculated as at the time only 15.4 overs had been bowled in the Mountaineers innings, and the Duckworth-Lewis system requires a minimum of 20. At the time of the abandonment Mountaineers were looking the more likely winners, but had a couple of quick wickets fallen the situation might have been very different. Two remarkable innings dominated the match, those by the Stars captain, Tinashe Kamunhukamwe, and by the experienced Hamilton Masakadza for Mountaineers. Kamunhukamwe was so dominant in the Stars innings that he scored 128 out of a total of 241 off only 98 balls, hitting five sixes and 15 fours. He received good support for a while from Tarisai Musakanda, who scored 15 out of a stand of 73 for the third wicket, and later by Mohammad Faraz Akram (29), as they put on 66 together for the sixth wicket. After Kamunhukamwe fell with the score on 199, Brandon Mavuta batted well for 31 not out to take the total to 241 in 47 overs. Natsai M’shangwe was the most successful of the Mountaineers bowlers, taking three wickets for 43, but the only bowler able to contain Kamunhukamwe was the left-arm spinner Wellington Masakadza, who took one wicket for only 26 runs in his 10 overs. When Mountaineers batted, Hamilton Masakadza played superbly, scoring 60 not out off 39 balls, with eight fours and two sixes, before the rain came. 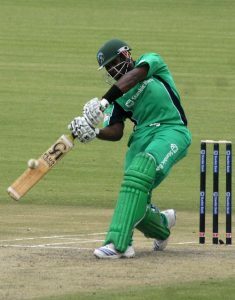 Ngoni Mupamba supported him well with 16 in a third-wicket partnership of 66, but only 15.4 overs were possible. Two of the three wickets to fall were taken by Faraz Akram. When the rain stopped, the outfield was too sodden for any further play to take place. At a scoring rate of more than six an over, Mountaineers were well placed for victory if they had kept wickets intact. These two teams are likely to meet again in the competition final at Harare Sports Club on Saturday, as they now have 21 points each (Mountaineers with a match in hand), and Bulawayo Metropolitan Tuskers and Harare Metropolitan Eagles have an almost impossible task to catch them.